Occasionally you may see “stains” or whitish material on the surface of the Epotec. This if it happens at all, usually shows up 3 – 6 months after Epotec application. It will be more visible on darker colours such as Pacific than lighter such as Bondi or Sky. 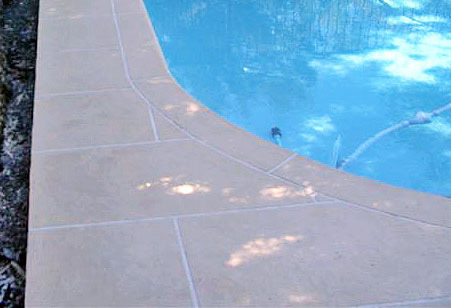 Additionally there may be “stains” above the water line and on adjoining surfaces, such as pavers etc. Our long experience shows these stains are largely cosmetic and are related to pool water chemistry. They can be found in Salt Water Pools (quite often) Chlorine Pools (sometimes) and those filled with water containing a high mineral content such as in rural Australia and some cities. Most pool shop water analysis tests don’t test for these situations which are caused by impurities in the salt or chemicals in your pool. Your pool maybe be well balanced chemically, yet still show these effects. See images below. Usually the result is a white (but sometimes brown, if iron present) precipitate which is seen on the surface and can be wiped off by hand, below the water line. (You will see a glossy paint surface where you wiped your hand) Above the water line there may be stain marks where the water has dried leaving behind a hard residue. It should be remembered that salt is a naturally occurring mineral and though mostly sodium chloride also has traces of many other minerals. Additionally the chlorinator cell is a chemical factory which also produces by-products from these impurities, such as “scales”, carbonate and sulphate forms which are quite hard. A 50,000 litre pool may have 200 kgs of salt at 99% purity but produces at least 2 kgs of impurities to be deposited on the pool surface often as calcium or magnesium sulfates or carbonates. In chlorine pools there is not only the effect of natural hardness but also with 65% granular chlorine, which contains 35% calcium carbonate, an insoluble salt, which causes cloudy water and becomes deposited on the surface as scale. It may also show as “blue” stains on feet or hands and is a result of the abrasive effect of these fine, hard particles and body contact with pool surfaces, “sanding off” some of the paint. It’s a bit like when you “cut and polish” your car, the same mild abrasive effect. The Langelier Saturation Index will provide information as to when scale or precipitations will from and should be used as a guide to prevent it happening. It would be worth discussing with your pool shop. See the images below to check if this is what your pool has. You can also quickly check by carefully using some diluted Hydrochloric (pool) Acid (about 1 part acid to 2 parts water, add acid to water and wear protective goggles and gloves). Carefully put some on a “white” stain. If it fizzes – bubbles or reacts, it’s an alkali (salt) issue as detailed here in. If no reaction then it may be an Epotec issue. Epotec does not react to acid attack. Usually to remove the cause, obtain a clarifier, flocculating or precipitating agent from your pool shop and follow instructions. It may need repeating every few years or after adding more chemicals to your pool. We are not skilled in pool water chemistry however your pool shop should be able to answer all your questions and provide an effective solution. Clarifiers and flocculating agents generally work by causing small particles that pass through your filters, to bind together into bigger particles, which may then be filtered out. There are 2 main types: Alum or Aluminum sulfate and Polymeric such as poly aluminum chloride. Depending on your filtration system you should use one or other of these types. Check that your filter system is functioning correctly and not blocked or letting fine particles through the medium. Follow the Clarifier or Flocculate directions carefully. Using too much of Alum can in fact recreate the same effects again. The whole issue is quite technical and you need a good and well trained pool shop technician to work through the process with you. To prevent re occurrence you may need to get a more detailed pool water chemistry program from your pool shop or chemical supplier. Usually having a pH of 7.3, TA of 130 and CA about 280 will help prevent the reoccurrence, but it still requires making sure there are no insoluble salts in your pool. Ask for a Langelier test as well when you take your pool water in for testing. The reason these “white” marks did not show up on your pool before it was painted, is because it will generally have had a whitish surface. This is the case with Fibreglass, Marblesheen concrete, or previously painted. The surface will also generally be weathered, so chances are it did not show, compared to the new hard, nonabsorbent surface you now have. As a comparison consider how much dust you see on a dark seamless surface compared a white, flat – low sheen surface. Removing White Stains above the Water line. Usually these will be quite hard and seem difficult to remove having been “baked” on by sun over the months. You may try a scouring pad (3M green and Yellow) and some detergent firstly to see if this works. Otherwise a mild car abrasive (cut and polish) with no water, but a use soft pad or old tooth brush, then rinse off. This usually works, without affecting the Epotec. If really hard to remove, it may require more effort and even a recoat once the cause has been dealt with. Vegetation that drops into the pool such as leaves, seed pods, and so on may leave a tannin stain as they rot and it may be on bottom or at water line. Also silt, dust, coal and iron, diesel particles, (including near railway lines and main roads), can also leave a fine film of material at water level, causing stains which often are black – brown in colour. Bottle tops will stain the bottom too. Try removing these stains as per above. Epotec is resistant to surface contamination and fungal growth. However over time the surface will tend to change with the attachment of slim and fat build up. This can be removed easily by giving the surface a “wash” with a broom or brush. The most affected areas will be at the water level, and within 300 mm of it. Body fats, suntan lotion and other matter that floats on the water surface will tend to stick to the sides of the pool. 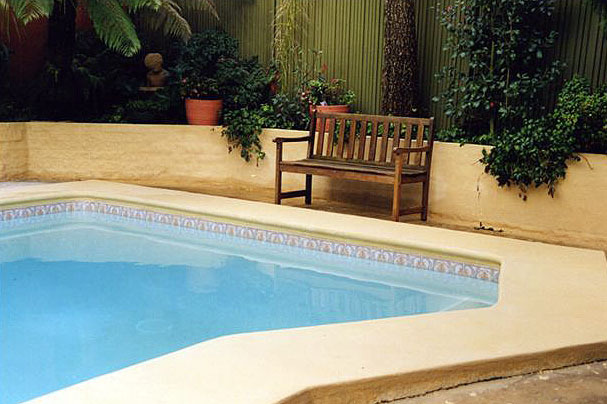 A regular scrub in this area should be a part of the maintenance program of the pool.